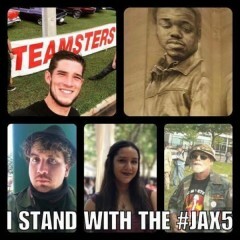 5 Jacksonville anti-war protesters released after posting $157,000 dollars for bail | Fight Back! Jacksonville, FL – Five protesters were finally released on bail from Jacksonville jail on Saturday evening, April 8. The protesters were arrested and several were beaten at a “No War in Syria” rally held on April 7, where police allowed a right-wing provocateur with a Trump flag to enter the protest and physically assault speakers and organizers of the rally. Instead of stopping the provocateur, the police descended upon Connell Crooms, a deaf Black man, who the provocateur had assaulted. The police savagely beat, kicked and tased Crooms - who is a well-known union activist and Black Lives Matter leader in Jacksonville - until he was unconscious and had to be taken to the hospital. The police also beat and arrested a 74-year-old Vietnam veteran, Willie Wilder; the leader of the Jacksonville Coalition for Consent Christina Kittle; and a transgender activist Toma Beckwith. Finally, the police arrested prominent union leader and activist Dave Schneider and charged him with “felony inciting a riot” for organizing the protest. Police did not arrest the provocateur who assaulted protest participants. The Jacksonville community quickly rallied to the defense of their beloved community leaders and activists. 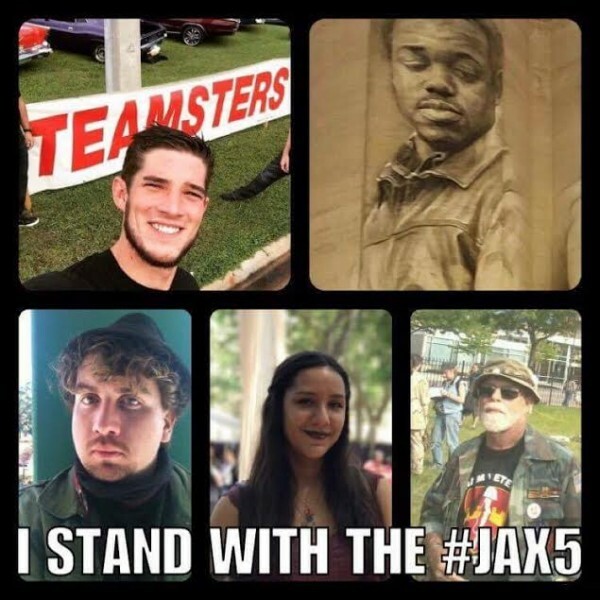 On April 8, over 200 people, including leaders in the labor movement, Black community, and progressive groups assembled to demand that all the charges against the Jacksonville 5 be dropped. Supporters chanted “Drop the charges” and the mother of Connell Crooms gave a tearful testament to Connell's character. Community leaders called for a full independent investigation into the police misconduct on April 7, and an investigation into the police spying program on progressive activists in Jacksonville. Just weeks earlier, Jacksonville's Florida Times Union reported that the Jacksonville Sheriff's Office (JSO) had been spying on protesters, amongst them, Dave Schneider, Connell Crooms and Christina Kittle. Police issued a trumped-up press release claiming that the protesters had “incited a riot” and they attempted to demonize the arrested activists. However, dozens of people took video of the police brutality and the actions of the provocateur whose social media pages contains ties to white supremacy groups. The JSO then prevented family members from seeing loved ones at the hospital and arbitrarily changed rules at the jail to close off the first appearance hearings. Some family members drove from out of state to be present at these hearings and were at first told the rules of the court. Officials then informed friends and family that only family with the same last name would be allowed. This was again changed to only “parents” were allowed in until they finally settled on shutting off the courtroom entirely and kicking attendees out of the waiting area. To add insult to injury, the total bail amount issued by the court for all five arrestees came out to over $157,000. Despite this outrageous amount, activists and families were quickly able to mobilize national support and raised the money necessary for bonds in a matter of hours. There is a continuing fight to drop the charges and investigation into abuses by the JSO. Supporters will soon be able to donate to the legal defense fund.